4 large cassava, peeled and chopped into large chunks Flavourless oil, for frying Sea salt, for seasoning Bring a large pan of salted water to the boil and add the cassava chunks. Boil until tender, around 30 minutes, then drain and allow to cool slightly. Heat the oil in a large, heavy based saucepan until smoking hot, and then, working in batches, add the cassava and deep fry until golden brown. Lay each batch on kitchen paper to soak up excess oil, then sprinkle liberally with sea salt. Serve Hot. .. 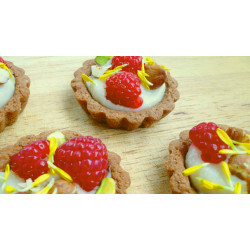 Filling 4 taro 3 tablespoons honey 1 tablespoon vanilla extract 1 tablespoon coconut oil (plus more for oiling pans) Crust 1 1/2 cups almond flour ½ cup arrowroot flour 2 tablespoons cocoa 2 tablespoons coconut oil 4 teaspoons honey 4 teaspoons water Assembly Chopped hazelnuts Chopped pistachios Raspberries Edible flowers Heat oven to 180°C. 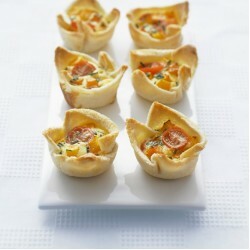 Grease ten 2.5" fluted tartlet pans, set aside. Thoroughly wash the taro, scrubbing to remove any dirt from the hairy skin. Peel and chop into 1 inch cubes and place in a medium saucepan. Fill with enoug..
Cassava is a long tuberous starchy root which has brown fibrous skin and white interior. It has a texture like a stringy potato or pumpkin. Other names for Cassava are yuca, manioc, mandioca, yucca root, casabe, and tapioca. Cassava can never be eaten raw as it contains Prussic Acid (Hydrocyanic Acid) which can cause cyanide poisoning. Cooking or pressing the root thoroughly removes the poison. 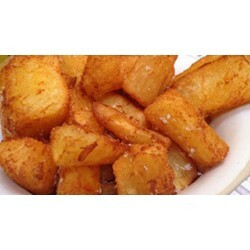 Cassava is incredibly versatile, it can be boiled, baked, steamed, grilled, fried, mashed or added to stews. Frequently it is served with meat. 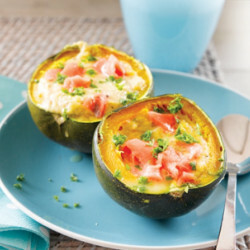 sprinkled with sal..
4 gem squashes 2 large eggs 1/4 cup breadcrumbs 250g reduced-fat ricotta cheese 100g smoked salmon pieces 400g can creamed corn 1 teaspoon oregano or chives, finely cut. Cut each gem squash in half. Arrange halves bowl-side up onthe microwave plate and microwave for 5 minutes on high. While gem squash is cooking, make the stuffing: break eggs into a large bowl and beat with a fork. Stir in breadcrumbs. Stir in ricotta, creamed corn and salmon. Microwave on high for 30 seconds. Wait until gem squashes are cool enough to touch. Scoop seeds out and discard. 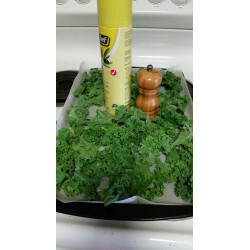 Fill gem squash halves w..
1 bunch Kale Olive oil spray Salt Preheat oven to 160 degrees Celsius. Line a baking tray with baking paper. Tear up the kale leaves into slightly larger than bite size pieces. Do not include the thicker stems. Spray the leaves with olive oil and sprinkle with salt. Cook for 20 minutes, keeping an eye on them as they can burn easy. Cool, then enjoy! ..
300g pumpkin, peeled and cut into 1cm cubes Olive oil spray 12 slices white bread, crusts removed 12 cherry tomatoes, halved 125g Spreadable Cream Cheese 3 eggs 1/4 cup cream 2 tablespoons chopped chives Salt and pepper, to taste Place pumpkin on a lined baking tray and spray with oil. Bake in a hot oven at 200°C for 15 minutes or until tender. Roll each slice of bread to flatten, then press into 12 x 1/3 cup capacity greased muffin pans. Spoon in the pumpkin and tomato. Whisk the cream cheese, eggs, cream, chives and seasonings until smooth, then spoon evenly over the vegetab..
2 tablespoons butter 1/4 teaspoon cinnamon 1/4 teaspoon ground nutmeg 1/4 teaspoon ground allspice 6 Bosc pears, peeled, cored and quartered Juice of 1/2 lemon 1 1/2 cup nonfat yoghurt 1/2 cup chopped, toasted walnuts Melt butter in a pan over medium heat. Stir in spices and cook for 30 seconds or until aromatic. Add pears and cook for 15 minutes or until tender, stirring frequently. Stir in lemon juice. 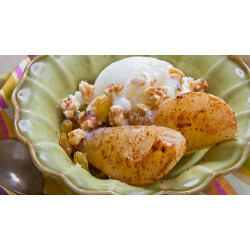 Serve with nonfat yogurt and top with walnuts. ..
700g large beetroot 2 tsp fresh thyme 2 tsp balsamic vinegar 2 tbsp olive oil 2 tbsp clear honey Heat the oven to 200C. 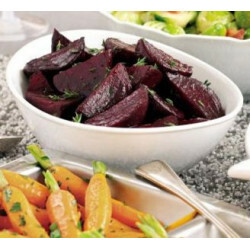 Cut each beetroot into 4-6 wedges and arrange in a large roasting tin. Mix together the remaining ingredients and pour over the beetroot. Season well, and toss together so all the beetroot is thoroughly coated in the dressing. Roast for 25 mins until the beetroot is sticky and glazed. ..
6 cloves garlic 1 onion 6 mushrooms 2 large ripe tomatoes 1 large or 2 medium eggplant 2 chicken breast fillets 1/2 cup tomato cooking base tablespoon tomato paste 1 tablespoon chopped basil 1 tablespoon chopped oregano Pink Himalayan rock salt 2 tablespoon olive oil Olive oil spray Preheat oven to 180 degrees. Wash eggplant and slice into rounds approximately 1 to 2cm thick. Line tray with baking paper and lightly spray with olive oil. Place eggplant rounds on tray. Spray with olive oil and lightly sprinkle with pink Himalayan rock salt. Bake in preheated oven for 30 minutes. 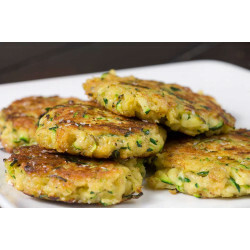 ..
1 large Zucchini 1/2 cup freshly grated Parmesan Cheese 1 cup Panko Bread Crumbs 1/8 teaspoon Nutmeg (too much will overpower recipe) 1/4 teaspoon Paprika 1 clove Garlic, minced 1 egg Salt and Pepper 1-2 tablespoons Olive Oil Grate Zucchini, press between paper towel to remove excess water. Place all ingredients except olive oil into a bowl and mix together. Scoop out portions of the mixture and form into patties. Heat olive oil in a pan over medium heat. Once heated, add patties and cook until golden brown. About 3-4 minutes per side. ..